Phenotypic determination of antimicrobial resistance in bacteria is very important for diagnosis and treatment, but sometimes this procedure needs further genetic evaluation. Whole-genome sequencing plays a critical role in deciphering and advancing our understanding of bacterial evolution, transmission, and surveillance of antimicrobial resistance. In this study, whole-genome sequencing was performed on nineteen clinically extraintestinal Escherichia coli isolates from chicken, cows and swine and showing different antimicrobial susceptibility. 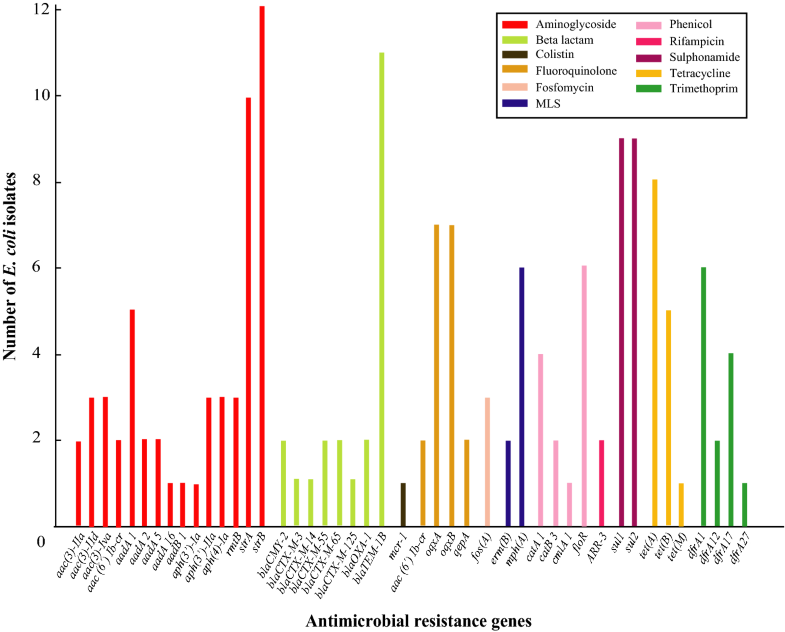 A total of 44 different genes conferring resistance to 11 classes of antimicrobials were detected in 15 of 19 E. coli isolates (78.9%), and 22 types of plasmids were detected in 15/19 (78.9%) isolates. In addition, whole-genome sequencing of these 19 isolates identified 111 potential virulence factors, and 53 of these VFDB-annotated genes were carried by all these 19 isolates. Twelve different virulence genes were identified while the most frequent ones were gad (glutamate decarboxylase), iss (increased serum survival) and lpfA (long polar fimbriae). All isolates harbored at least one of the virulence genes. The findings from comparative genomic analyses of the 19 diverse E. coli isolates in this study provided insights into molecular basis of the rising multi-drug resistance in E. coli. Antimicrobial resistance (AMR) in bacteria is an important issue related to the health of both human and animals (McDermott et al. 2016; Zawack et al. 2016). It has been reported that AMR bacteria are responsible for about 50,000 deaths in people each year in the USA and Europe, and 700,000 global death (Bottacini et al. 2017) (Zhang et al. 2017). Studies suggested that the agricultural use of antimicrobial agents increases the number of human infections caused by drug-resistant bacteria (O’Neill 2015). Thus, the AMR monitoring system should focus not only on humans, but also animal hosts and the associated environments (Zhang et al. 2017). Escherichia coli is a well-known commensal of the gastrointestinal tract of numerous animals, and also involved in intestinal and extraintestinal pathologies (Tenaillon et al. 2010; Croxen and Finlay 2010). E. coli show a clonal population structure with the delineation of at least seven main phylogenetic groups (Desjardins et al. 1995; Clermont et al. 2011). The chromosomal elasticity of the strains helps E. coli to adapt to different environments (Touchon et al. 2009). One of the key issues with E. coli is its role in the dissemination and emergence of bacterial antimicrobial resistance. Most of the resistance properties emerge from commensal bacteria in the gastrointestinal tract (Andremont 2003) where the bacteria grow to higher density, allowing horizontal transfers of resistance genes between strains from a single species, and even between species and genera. One of the mechanisms involved in the spread of AMR is the emergence of some specific clones that acquire resistance genes, mostly via mobile genetic elements including plasmids, gene cassettes, transposons, and other integrative genetic elements (Woodford et al. 2011). Because of its high level of discriminatory power, microbial Whole Genome Sequencing (WGS) strategy plays an important role in the investigation and surveillance of foodborne disease outbreak (Kröger et al. 2012). Better understanding of bacterial evolution, outbreaks, and transmission events revealed with the advent of WGS approach has been shown in a number of recent studies as well as from the surveillance of antimicrobial resistance (Zankari et al. 2012). It has significant advantages compared to other commonly used drug resistant testing approaches. WGS as a diagnostic method to detect bacterial antimicrobial resistance is particularly important where congruence exists between phenotype and genotype, and where phenotypic testing is prohibitively slow for slow-growing bacteria. Epidemiology has benefited greatly from high-throughput WGS in the aspects of identifying and tracking drug-resistant organisms as well as of identifying their genetic diversity (Organization 2014). The main aim of this study is to investigate the genetic diversity and relationship of E. coli clinical strains collected from chicken, cows and swine in China. The E. coli clinical strains were further characterized and assigned to the unique profiles of virulence factors and antimicrobial resistance genes. A total of 19 E. coli isolates (10 from chicken, 5 from swine, 4 from cows) were selected for WGS analysis in this study. The selection of these isolates was based on their significantly different phenotypes of antimicrobial resistance (Yassin et al. 2017a, b) (Table 1). Genomic DNA from all the 19 E. coli isolates were extracted, end repaired, ligated to specific adaptors and subject to paired-end sequencing using Illumina HiSeq 2500 by PE125 strategy at Beijing Novogene Bioinformatics Technology Company (Beijing, China). After filtering raw reads, the clean reads were de novo assembled into contigs using the CLC Genomics Workbench. The assembled genomes were analyzed by using online software tools provided by the Centre of Genomic Epidemiology (https://www.genomicepidemiology.org/). In addition, CGE ResFinder 2.1 was used to identify the antimicrobial resistance genes in the assembled genomes using (Zankari et al. 2012). The minimum percentage of the gene length detected and the identity threshold was set to be a 90.0% identity for a positive match between a target genome and the reference database. The MLST server database v1.7 (Larsen et al. 2012) and the Virulence Finder server database v1.2 (Joensen et al. 2014) in the CGE website were used to identify virulence genes and housekeeping genes (adk, fumC, icd, gyrB, mdh, purA, recA). The scaffolds of each isolate were incorporated into these tools as described in CGE, with an identity threshold set to be 98%. The profile of replicons of bacterial plasmids was identified by the use of PlasmidFinder-1.3 (Carattoli et al. 2014). Double index alignment of next-generation sequencing data (DIAMOND) (Buchfink et al. 2015) was applied to align the amino acid sequences against the VFDB database (Chen et al. 2015). The annotation of predicted gene with the description of the best fit was defined as amino acid sequences with alignment length > 90% of its own length and over 20% match identity. Phylogenomic relationships among strains were assessed based on nucleotide alignments of the core genome gene content, including only the single-copy orthologues. An additional filter for paralogues was applied to the core genome in order to exclude families represented by more than a single member since they do not represent robust evolutionary markers (Gutiérrez and Maere 2014). Gene alignments were conducted using MUSCLE v.3.8.31 (Edgar 2004), followed by construction of a phylogenetic tree for each single-copy gene using the maximum-likelihood (≤5 samples) in PhyML v3.0 (Guindon and Gascuel 2003) and tree concatenation (Bottacini et al. 2017). This Whole Genome Shotgun project 19 E. coli isolates investigated in this study has been deposited at DDBJ/ENA/GenBank under the following accession numbers: E. coli E565, QETO00000000; E. coli E535, QETQ00000000; E. coli E533, QETR00000000; E. coli E530, QETS00000000; E. coli E497, QETT00000000; E. coli E461, QETU00000000; E. coli E433, QETV00000000; E. coli E418, QETW00000000; E. coli E393, QETX00000000; E. coli E386, QETY00000000; E. coli E205, QETZ00000000; E. coli E175, QEUA00000000; E. coli E122, QEUB00000000; E. coli E100, QEUC00000000; E. coli E80, QEUD00000000; E. coli E34, QEUE00000000; E. coli E30, QEUF00000000; and E. coli E2, QEUG00000000. Strain E497 from chicken, one of the multidrug-resistant E. coli strains investigated in this study, was deposited at China General Microbiological Culture Collection Center (CGMCC) with a deposit number of CGMCC-10601. All 19 clinical E. coli isolates, except for E433, E535, E80 and E533, displayed MDR phenotype with resistance to 2–16 antimicrobials (Table 1). In total, we identified 14 resistance patterns, and none of the strains was resistant to ertapenem. Based on antibiogram results, the 19 clinical E. coli isolates were divided into five groups (Table 1). Four of 19 strains did not harbor any of the antimicrobial resistance genes analyzed, while the remaining 15 isolates had more than one resistance gene. A total of 44 different antimicrobial resistance genes were identified in these 15 isolates conferring resistance to 11 classes of antimicrobials (Fig. 1). One isolate (5.3%) possess mcr-1 gene in a full-length copy of a colistin resistance gene that showed 100% nucleotide similarity to the reference database sequence (Table 2). Through WGS analysis, 22 plasmid replicons were identified in 15 of the 19 isolates. Fourteen isolates harbored multiple plasmid replicons. Eighteen types of Inc with different frequencies were found, including IncA/C2, IncFIA, IncFIB (AP001918), IncFIB(K), IncFIB(pLF82), IncFIC(FII), IncFII, IncFII(pCoo), IncFII(pHN7A8), IncHI2, IncHI2A, IncI1, IncI2, IncN,, IncQ1, IncR, IncX1 and IncY (Table 3). At least one virulence gene was detected in all 19 E. coli isolates evaluated. Twelve different virulence genes were identified while the most frequent ones were gad (glutamate decarboxylase), iss (increased serum survival) and lpfA (long polar fimbriae) which were identified in 14, 11 and 9 isolates, respectively (Table 4). The multilocus sequence typing of the isolates is shown in Table 5. Three isolates (E100, E386 and E433) belong to Sequencing Type (ST) 155 while two isolates (E461 and E565) belong to ST 23 and another two isolates (E80 and E533) belong to ST 297. The remaining 12 isolates belong to individual MLST types, ST2505, ST746, ST656, ST10, ST3345, ST4012, ST6856, ST602, ST2111, ST5019, ST548 and ST4753. In this study, WGS of these 19 isolates and the analysis identified 111 potential virulence factors. Fifty-three of these VFDB-annotated genes were carried by all these 19 isolates. The VFDB-annotated genes are responsible to adherence, autotransporter, invasion, iron uptake, toxins, secretion system and secretion system related effectors. Different potential virulence factors with different abundance were observed, and the most abundant virulence factors was associated with adherence. In addition, some of the isolates contained pathogenic E. coli virulence factors, such as Chu (isolate E80) present in Enterohemorrhagic E. coli (EHEC) and Per (isolates E30, E205, E433, E533) present in Enteropathogenic E. coli (EPEC). In this study, a total of 2858 core genes are present as single copies in isolates, and the resulting phylogenetic tree was computed using the 19 clinical E. coli isolates sequenced while E. coli CP009072 serves as an outgroup (Fig. 2). The phylogenetic analysis provided complete resolution of relationships among all isolates sampled, with maximum support (100) for all nodes. The E. coli isolates are clustered in seven phylogenetic groups, and E543 was derived firstly from the lineage of the remaining members of the subfamily (Fig. 2). The isolates of E100, E386, E433 and E80 appear to be monophyletic and more closely related to E418 and E497 than to E2, E461 and E565. 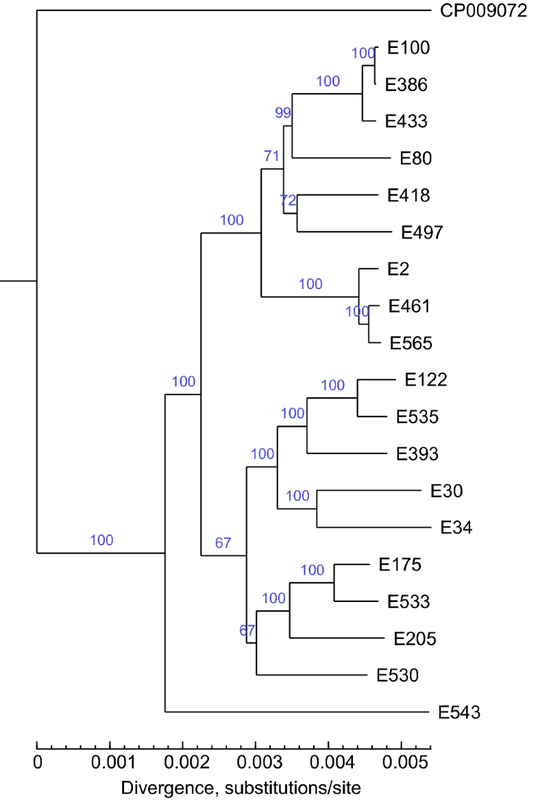 E. coli comprised this clade plus another in which E122, E535 plus E393 and E30 plus E34 (both monophyletic) were together adjacent to E175, E533, E205 and E530 (Fig. 2). The genetic characteristics of clinical E. coli isolates can provide useful information about the potential for causing disease and resistance to treatment. In this study, we analyzed the WGS of E. coli isolates obtained from chickens, swine, and cows in Jiangsu province, China. These isolates exhibited a diverse range of genetic profiles. These isolates have quite comprehensive profiles being resistant to beta-lactams, quinolones, aminoglycosides and colistin. Most of the strains displayed consistent antibiogram and antibiotic resistance gene profiles, but some of them showed inconsistency between the phenotype and the genotype. For instance, there is not any antibiotic resistance gene cluster profile displayed in the isolates E497 and E565 which however displayed resistance to a panel of antibiotics (Tables 1, 2). This is likely due to an unidentified regulatory mechanism in these isolates. In this study, one of the most important antimicrobial resistance genes identified was mcr-1, mediating resistance against colistin (Liu et al. 2016; Yassin et al. 2017a, 2017b). The plasmid-borne colistin resistance gene mcr-1 was found in bacterial strains of both humans and animals (Liu et al. 2016). This is of a great public health concern as these colistin is considered as “last-resort” drugs for human infections caused by multi-drug resistant Enterobacteriaceae (Shaheen et al. 2013). The identified mcr-1 gene by WGS in this study was verified by PCR and the mcr-1-positive E. coli was verified to be resistant to colistin (Yassin et al. 2017a, 2017b). Plasmids as diverse and self-replicating extrachromosomal elements encode a variety of traits which include antimicrobial resistance, virulence, and environmental adaptability. Plasmids also plays a major role in bacterial adaptation to environmental (Smets and Barkay 2005). Inc plasmids target the replicons of the major plasmid families occurring in Enterobacteriaceae (HI2, HI1, I1-ã, X, L/M, N, FIA, FIB, FIC, W, Y, P, A/C, T, K, B/O) (Carattoli 2009). Currently, there are 27 known Inc groups occurring among the Enterobacteriaceae family (Frost et al. 2005; Carattoli 2009). Classification of plasmids into Inc groups is desirable because specific plasmid types have been associated with virulence and/or antimicrobial resistance (Gilmour et al., 2004; Hopkins et al. 2006; Carattoli et al. 2014). In this study, 18 types of Inc plasmids were detected. IncI 1 plasmid has been shown to contribute to adhesion and invasion of shiga-toxigenic E. coli due to presence of a cluster encoding IV pili (Kim and Komano 1997). While plasmids mediating antimicrobial resistance in Enterobacteriaceae is highly variable, some plasmid families are largely prevalent and also prevalently associated with specific resistance genes (Carattoli 2009). As shown in Table 5, 19 clinical E. coli isolates possess 15 different ST types based on the MLST analysis. ST10 is one of the important multilocus sequence types possessed by one isolate (E122) in our findings, which confers resistant to colistin and is often reported as antibiotics against ESBL-producing E. coli (Chen et al. 2016). This ST type is also commonly found in chickens, other animals and humans (Chen et al. 2016) and this is consistent with our findings that this strain was isolated from chicken. Among 12 different virulence genes possessed by all isolates, the highest frequencies appeared was gad, iss and lpfA which were frequently reported in pathogenic E. coli isolates (Bergholz et al. 2007; Solà-Ginés et al. 2015; Malik et al. 2017). Thirteen isolates which carried these gene harbored multiple antimicrobial resistance genes, and 9 of them carried genes for lpfA virulence and that has been described to be a potential virulence marker for pathogenic E. coli (Petty et al. 2014). However, the presence of a single or multiple virulence genes in an E. coli strain does not warrant that a strain is pathogenic unless that strain has the appropriate combination of the virulence genes to cause infections in the hosts (Boerlin et al. 1999). Pathogenic E. coli uses a complex multi-step mechanism of pathogenesis involving a number of virulence factors which consists of attachment, host cell surface modification, invasion, a variety of toxins and secretion systems, eventually leading to death of the target host cells (Kaper et al. 2004). Thus, virulence genes are ideal targets for determining the pathogenic potential of a given E. coli isolate (Kuhnert et al. 2000). Virulence factors are important for microbial pathogenesis. A mutation of a virulence factor from a virulent pathogen will attenuate the pathogen strain (Volk et al. 1995). However, virulence factors may also exist in attenuated and even avirulent strains (Chen et al. 2015).Our study attempted to characterize the clinical isolates for the presence of virulence associated genes by comparison against a database collection of virulence factors, VFDB. In our study, we observed that 53 of the VFDB-annotated genes were shared within 19 clinical E. coli isolates. The most abundant adherence found in our isolates maybe related to the IncI 1 plasmids, which can encode the type IV pili. These virulence factors, along with their epidemic ability and resistance determinants, may have favored the dissemination of plasmids belonging to IncI 1 plasmid family (Carattoli 2009). Based on nucleotide alignments of the core genome of individual strains, phylogenomic investigation allowed us to deduce the evolutionary relationships between strains while 16S rRNA sequence-based phylogeny does not provide sufficient resolution at the intra-species level (Ventura et al. 2006). The phylogenetic analysis of the 19 clinical E. coli isolates in our study showed no group correlations between the isolates from the same species or numbers of antibiotic resistance genes possessed by them. MLST analysis showed that strains E100, E386, E433 and strains E461, E565 belonged to ST155 and ST23, respectively, which are phylogenetically similar. Unlike comparative genomics-derived clustering which is based on the presence-absence of genes, phylogenomic analysis is based on sequence alignment of core genes and for this reason it is more suitable for an in depth investigation of phylogenetic relationships between closely related taxa (Bottacini et al. 2017). This study confirmed that multiple drug resistance of most of the clinical E. coli isolates were probably due to the presence of different plasmids. Virulence genes carried by these isolates can increase potential risks on the health of human and animals. Virulence factors associated with adherence have the most abundance in Virulence Factors of Pathogenic Bacteria analysis. With the rapidly falling cost and turnaround time as well as availability of more user-friendly software, WGS promises to be transformative for rapid surveillance and genotypic antimicrobial susceptibility testing for microbes that are difficult to grow, and has great benefits in combination with phenotypic methods. The findings from comparative genomic analyses of the 19 diverse E. coli isolates provided insights into molecular basis of the rising multi-drug resistance in E. coli. The WGS-based characterization of multidrug-resistant E. coli from extraintestinal infections in three animal species in this study revealed a diverse range of E. coli STs, and demonstrated the emergence and persistence of particular multidrug-resistant strains, which may have a competitive advantage in fitness under antimicrobial selection pressure compared with previous strains. Surveillance of the emergence and spread of dominant multidrug-resistant isolates with unique plasmids, resistance genes, virulence genes and STs may assist veterinarians in developing improved strategies for treatment and prevention of infections for which the choice of antimicrobials is limited. CW, LC, XH and LW conceived of the study. AKY, JZ, JG, KQ, RRG, YZ and YY performed experiment and analyzed the data. CW, LW and XH wrote the paper. All authors read and approved the final manuscript. This work was supported, in part, by Alabama Agricultural Experimental Station and the USDA National Institute of Food and Agriculture, Hatch project (ALA052-1-17026).